File Photo: Africanized bees located in a tree like this one attacked a man Saturday, stinging him more than 100 times. GRAHAM COUNTY – A man was hospitalized Saturday after suffering numerous stings in a bee attack off East Hollywood Road. The bees were likely Africanized “Killer” bees, as most all wild bees in Arizona have been hybridized. A Graham County deputy was dispatched to the scene at about 7:30 a.m. regarding a bee attack. Upon arrival at the residence, the deputy located Severo Cabrera, 59, in distress. The deputy reported Cabrera’s eyes had begun to swell shut and that Cabrera said he was dizzy and had difficulty breathing. The reporting party, who also was stung a couple of times, said Cabrera was washing his face outside when a swarm of bees in a nearby tree suddenly attacked him. Cabrara corroborated the statement and said he took off his shirt after he was initially stung and tried to use it to swat the bees away. He also attempted to spray the bees with water to no avail. Eventually, the men were able to evade the bees by running from them. Paramedics from Southwest Ambulance treated Cabrera at the scene and then transported him to Mt. Graham Regional Medical Center. According to a paramedic’s report to the deputy, Cabrera suffered more than 100 stings. Africanized bees in the western hemisphere are nearly all descended from hives operated by biologist Warwick Kerr in Brazil in the late 1950s. Kerr was attempting to cross breed the African bees with European honeybees. In 1957, a visiting beekeeper accidentally allowed some of the bees to escape, and the bees cross-bred with local European colonies and became one of the most successful biologically invasive species of all time. Africanized bees are superior pollinators and honey producers compared to their European counterpart, but while the Africanized bees’ sting is no worse than a European bee sting, they tend to swarm more frequently and attack for longer periods. 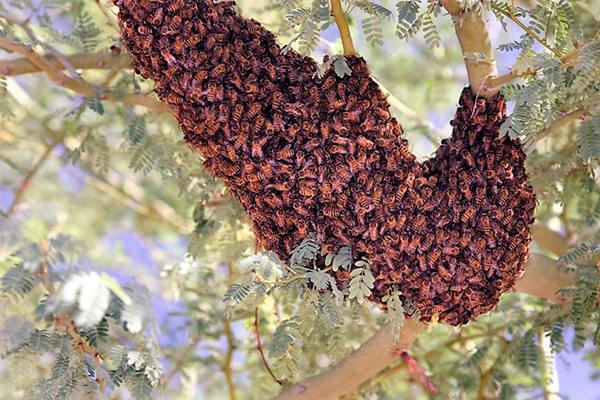 Africanized bees are also more easily provoked, attack in large numbers and pursue over distances up to a kilometer. First reported in Arizona in 1993, the bees are now prevalent throughout the state. Over the past decade, the Gila Valley has had two human deaths and multiple animal deaths due to bee stings. Run away quickly. Do not stop to help others. However, small children and the disabled may need some assistance. As you are running, pull your shirt up over your head to protect your face, but make sure it does not slow your progress. This will help keep the bees from targeting the sensitive areas around your head and eyes. Do not stop running until you reach shelter, such as a vehicle or building. A few bees may follow you indoors. However, if you run to a well-lit area, the bees will tend to become confused and fly to windows. Do not jump into water. The bees will wait for you to come up for air. If you are trapped for some reason, cover up with blankets, sleeping bags, clothes or whatever else is immediately available. Do not swat at the bees or flail your arms. Bees are attracted to movement, and crushed bees emit a smell that will attract more bees. Once you have reached shelter or have outrun the bees, remove all stingers. When a honeybee stings, it leaves its stinger in the skin. This kills the honeybee so it can’t sting again, but it also means that venom continues to enter the wound for a short time. Do not pull stingers out with tweezers or your fingers. This will only squeeze more venom into the wound. Instead, scrape the stinger out sideways using your fingernail, the edge of a credit card, a dull knife blade or other straight-edged object. If you see someone being attacked by bees, encourage that person to run away or seek shelter. Do not attempt to rescue the person yourself. Call 9-1-1 to report a serious stinging attack. The emergency response personnel in your area have probably been trained to handle bee attacks. If you have been stung more than 15 times or are feeling ill, or if you have any reason to believe you may be allergic to bee stings, seek medical attention immediately. The average person can safely tolerate 10 stings per pound of body weight. This means that although 500 stings can kill a child, the average adult could withstand more than 1,100 stings.